Forum member dopefish created a widescreen patch that is usable in BF2, BF2142 and BioShock. You can get hit his personal page for the hack here, where he maintains a full feature list and changelog. You can join in this discussion thread in the forums. The patch is allowed by Punk-Buster. Though not officially supported, EvenBalance and EA have both confirmed it is allowed. The WSGF is home to a lot of different game solutions. Some are easy (like an .ini edit), but others are quite difficult (HEX or memory editing). This article collects a number of tools used to edit popular titles. Ok this game is VERY old but you might want it for nostalgic reasons. It 'may' only work for single player, i haven't tried it online (version might be different). I searched online for a widescreen hack and couldn't find one so i downloaded the source and made my own (all perfectly legal - id released source code for Quake II). 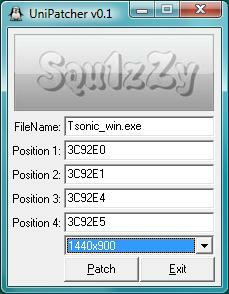 You can download the recompiled .exe here. Racer_S (who runs http://www.tocaedit.com/) is probably the most prolific widescreen and Surround hacker on the Internet. He is responsible for more high profile FOV and Camera hacks that anyone else. This page lists most of the hacks he has produced, including some not directly related to widescreen gaming (e.g trainers, controller emulators). Hacks for individual games have been attached to the individual DR pages on the site. Squ1zZy put together a patcher to do the manual work of replacing HEX offsets. 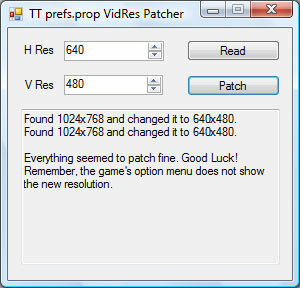 If someone has found the offets in a game, you can use this patcher to substitute in the values for your resolution. Below is a screenshot showing example offsets. You can discuss the tool in this thread. Here is the info for patching Star Wars: Knights of the Old Republic with the WS and HUD patches, so that the game will run properly in widescreen. Note that you should perform the steps described in both the WS Resolutions and HUD Correction sections. Stevedroid has created new HUD files that fix the map stretching issue in the HUD. Overall, the HUD still stretches, but this removes the glaring flaw of the map not showing the player's actual position. There are HUD files for 16:9 and 16:10. Unzip and place the mipc28x6_p.gui file in the Override folder found under your main KOTOR 2 installation directory. How would you like to play Sam and Max season 1 in 1920x1080 widescreen? How about other special modes your monitor supports? 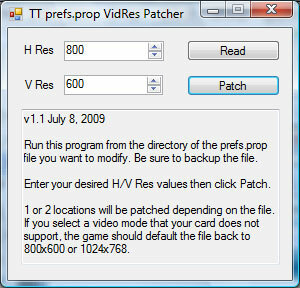 Just download the TTres patcher from here. You also need to download and install the Visual C++ Runtime Components. 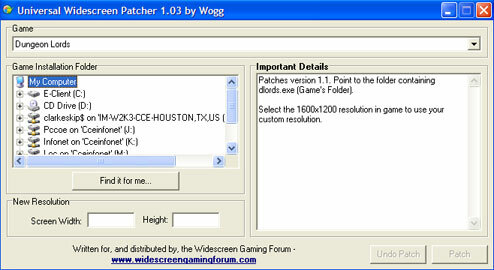 Started by Wogg, and continued by Mird-OC and Arcus, the WSGF features the Universal Widescreen Patcher (UniWS for short). Games that use the UniWS go way beyond the .ini and Registry hacks that we are all used to. The UniWS patches .dll and .exe files found in several popular "AAA" titles. The Patcher consists of two parts: The uniws.exe (which is the GUI interface and patcher), and the patches.ini file (which contains the game data to make the patch). You can download both here: uniws.zip.